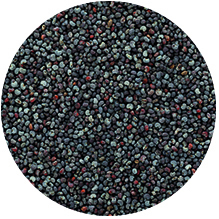 Nutty and pleasant in taste, poppy seeds are nutritious oil seeds used in baking & cooking. Poppy seeds are a good source of dietary fiber. Contain good levels of minerals like iron, copper, calcium, potassium, manganese, zinc and magnesium. The seeds are an excellent source of B-complex vitamins such as thiamin, pantothenic acid, pyridoxine, riboflavin, niacin, and folic acid. The seeds are widely used in confectionery and baking , decorating rolls, bagels, biscuits, and cakes.